I know that it's Friday night and I'm supposed to be posting some type of pub/grub food, but after eating Paella and Enchiladas this week I really wanted to eat something lite and healthy. Plus it has been 85 degrees here the past three days and so I wanted something cold and really easy to make. 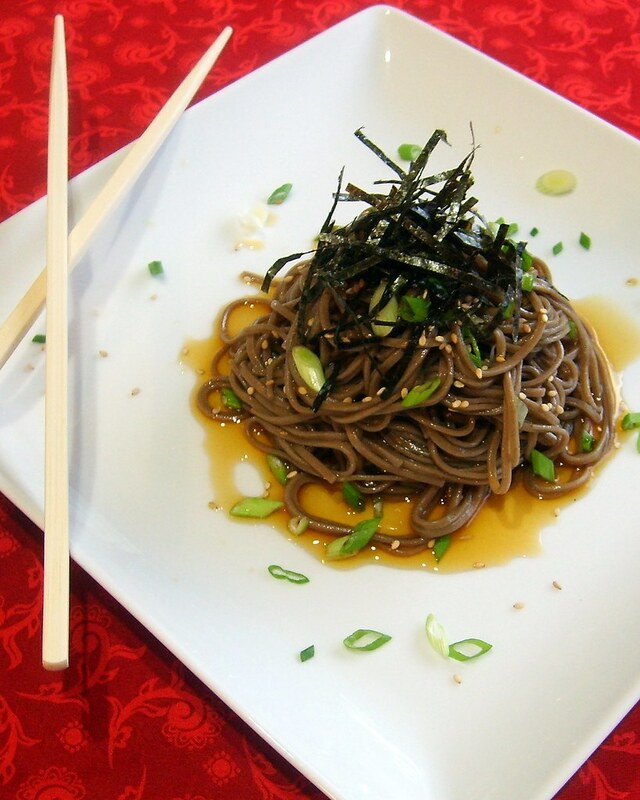 Soba Noodles are made with buckwheat flour and are very high in protein. A single serving has 14g of protein. They are also a good source of B vitamins. I like using vermicelli style noodles because I like a thinner noodle. However, they cook really quick and so you need to keep checking them or you'll end up with a gummy mess. Start by making kombu-dashi, which is a seaweed and mushroom broth. Soak kombu in filtered water for at least six hours. Next, bring water up to a boil, remove from heat and let kombu steep for 2-3 minutes. Remove kombu and discard. Add shiitake mushrooms to broth and bring to a boil again, remove from heat, cover and let steep for 30 minutes for mushrooms to soften and to flavor broth. The longer you steep, the more flavor you'll have. Strain broth into a large bowl and discard mushrooms. Next you need to prepare the dipping sauce, which gets combined to the kombu broth you just made above. In a small pan, heat mirin and simmer for a couple of minutes, add soy sauce and agave syrup and bring to a boil. Remove from heat and add to the kombu broth. Stir to combine and chill in the refrigerator until ready to use. Cook soba noodles according to package directions. When finished, rinse the noodles really well, soaking in cold water and using your hands to separate the noodles, and rinse again. I repeat this several times to make sure that most of the starch is removed from the noodles or they will stick together. After rinsing, drain really well. You can also toss them with a little of the dipping sauce before you place in the refrigerator to chill. While noodles are chilling, prepare the daikon and carrot slaw, cut the scallions and toast the sesame seeds. To serve, portion out noodles on the plate, drizzle with a little of the dipping sauce and top with scallions, sesame seeds and toasted nori strips. Serve with more dipping sauce on the side, along with the daikon slaw and a little wasabi for heat. Enjoy!